00:30:00 Makes 4 servings, 1/4 recipe (276 g) each. Makes 4 servings, 1/4 recipe (276 g) each. Everyone in the KRAFT KITCHENS loves one-pot recipes and this one is a favourite! Skillet-cooked chicken and rice are topped with a cheesy sauce that gets a kick of flavour from tomato salsa - sounds good, right? Heat large nonstick skillet sprayed with cooking spray on medium-high heat. Add chicken; cook 2 min. on each side. Remove chicken from skillet; set aside. Add water and rice to skillet; stir. Bring to boil. Return chicken to skillet; cover. Reduce heat to medium; cook 10 min. or until chicken is done (165ºF). Remove skillet from heat. Let stand, covered, 5 min. or until rice is tender and liquid is absorbed. Meanwhile, combine Velveeta and salsa in microwaveable bowl. Microwave on HIGH 2 min. or until Velveeta is completely melted and mixture is well blended, stirring after each minute. Serve over chicken and rice. 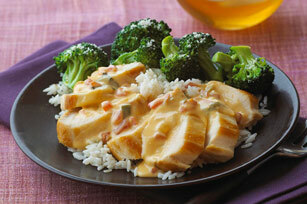 Serve with steamed broccoli florets tossed with Kraft 100% Parmesan Grated Cheese. Thaw chicken in the refrigerator, allowing 5 hours per pound of chicken. Never thaw chicken at room temperature due to the risk of bacterial growth. Serving Size Makes 4 servings, 1/4 recipe (276 g) each.